I tend to get the blues every October. It sneaks up on me. I’m half way through the month and wondering why my energy levels are shot and I’m going round in circles feeling quite miserable and unmotivated. Then I remember: it’s just October. Usually I’ve pulled things around come November. However, this year I had an exciting and productive month. The secret, I believe, is oats. So here I’m republishing something I originally put up on Triond a long time ago. People who are successful at making lasting improvements to their health are those who have good habits father than a tendency to go “all out” for one thing or another without being able to sustain it in the long run. It is the simple things you do every day (like brushing your teeth) that have a cumulative beneficial effect on your ability to fight infection, maintain a safe body weight, and stay well. It is said to take 21 days to form a habit and just 4 to break it so you need to be determined. However, most of us try to bite off more than we can chew and change too much in one go – setting ourselves up for a fall .There are simple things that you can introduce gradually into your daily routine to reap lifelong benefits. Pick just one to do every day and when you have got that down, add another one into your daily practice. Regulating bowel function by providing a source of fibre. Most of us don’t realise how miserable our bowels make us when they are not working properly but they have been consistently linked with mood. Even if things feel alright down there, your body can still be under unnecessary stress when digestive processes are sluggish. Boosting up the production of serotonin – one of the “happy” neurotransmitters. Many antidepressants work by acting on the serotonin system. Oats are a natural answer. 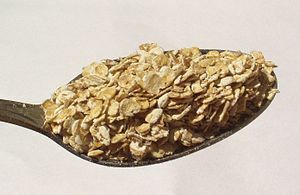 Vitamin b6 found in oats is an essential raw material for the production of Tryptophan, an amino acid that is an essential stage in the manufacture of serotonin. Low levels of serotonin are associated with depressive symptoms, interrupted sleep and craving for carbohydrates and can be a particular problem when you are not getting enough sunlight. Balancing blood sugar and energy levels. While oats are being digested they release energy to the body on a slow and sustained curve for several hours and so provide a more useful supply of energy through the day. This is preferable to a “sugar high” that causes stress to the body’s systems and results in those cravings for more carbohydrate. In my own experience, if I have a decent bowl of oats at about 9am I can easily last until 2pm before feeling that I really must have something to eat again. It doesn’t matter how you get your oats, raw by the spoonful, as porridge or even by switching to oatmeal based bread and other cereal products. Of course, big organic rolled oats with bits of hull stuck to them would be my ideal choice. For me, the best practice is to start the day with a bowl of oats and to redouble the benefit you can receive from this, take a tip from ancient tradition: Ideally oats should be soaked overnight in water (or a non-dairy milk). This makes them more digestible as enzymes will have begun to get to work by the morning and a tiny bit of fermentation enhances the nutrient content. Try a daily dose of oats for a week and see if you notice the difference in your mood.